Does Coffee Help Students Perform Better In Class? We all love coffee. That’s a fact. 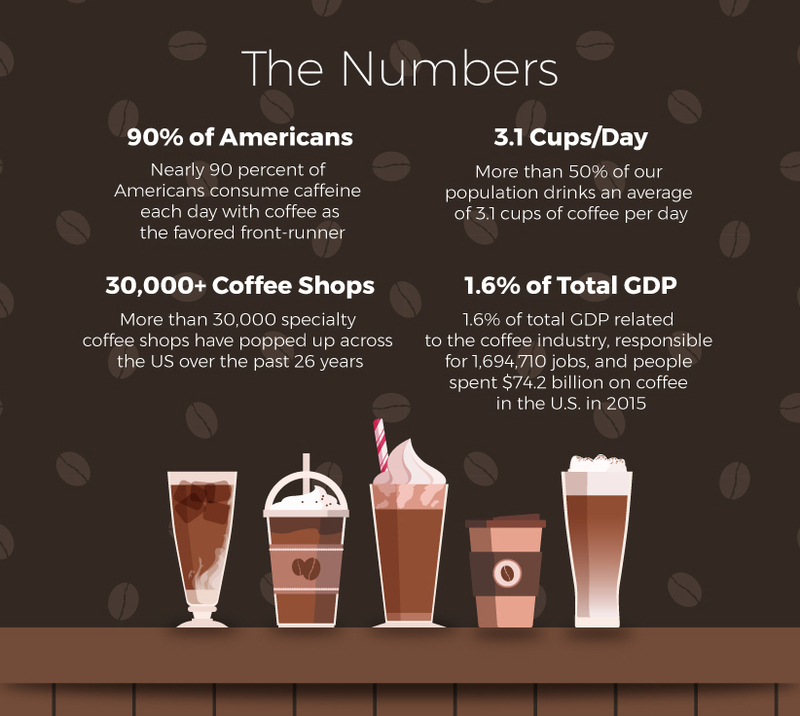 Almost 90% of Americans drink caffeinated beverages every day, and coffee seems to be their favorite. However, there is a certain group of people who need coffee just to survive – students. An average college student’s life is closely associated with this beverage, but why? Can it really do wonders with one’s academic performance, or does it only cause harm? Let’s see. 96% of students drink caffeinated beverages regularly. 65% consume caffeine every day. Female respondents tend to show more concern about the expenses linked to regular coffee consumption. 67% of the surveyees drink coffee, 21% choose tea, and 12% prefer energy drinks. When it comes to daily consumption, 72% of responders drink 3 cups of coffee every day. The average cup size among students is 9 ounces. 4% of students said that they drink coffee and other caffeinated beverages occasionally and don’t feel any strong need for caffeine. 89% of responders tend to stretch their consumption throughout the day, while 11% said they take several servings in one sitting. 84% of students who regularly pull “all-nighters” said they prefer coffee, while the rest 16% chose energy drinks (7% of them occasionally drink both coffee and energy drinks during the night of studying). 71% of responders said that they prefer coffee-based beverages like lattes, cappuccinos, frappes, etc. over pure coffee. 29% of students take their coffee black, with 18% of them giving their preference to regular drip coffee and 11% choosing strong espressos). 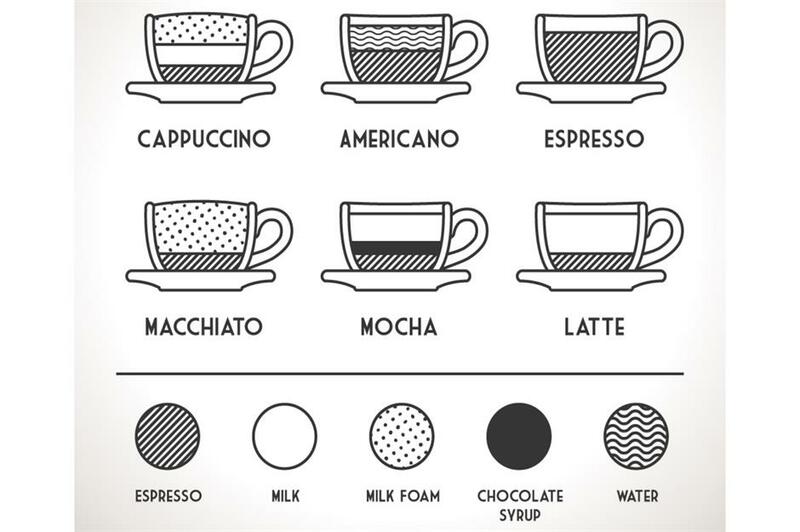 Americano with milk seems to be number one favorite among the coffee-based beverages, and cappuccinos take the second place. Specialty beverages like frappe, mocha, caramel macchiato, Flat White, etc. are mostly ordered when spending time with friends and resting, while regular coffee is drunk when students need to stay alert and get some work done. 49% of respondents said that the main reason they drink coffee is its stimulating properties. 30% claim they drink coffee for flavor. 21% of college students said they like coffee for both flavor and stimulating properties. The first thing we all know about caffeine is that it is a stimulant, which means it affects the central nervous system. Caffeine puts our brain in the “fight or flight” state, which basically makes us more alert, energized, and simply “pumped”. It can increase the speed of reasoning and attention, which can come in handy in one’s academic performance. Regular caffeine consumption is linked to lower risks of dementia and Alzheimer’s disease. Many scientists suggest that caffeine reduces the risk of suffering from certain types of cancer, including skin, endometrial, breast, prostate, neck, mouth, and throat cancers. Caffeine is known to reduce the risk of developing kidney stones. Regular coffee consumption is linked to a lower risk of cardiovascular disease. Caffeine has a positive effect on one’s memory and can even improve memory consolidation (or at least enhance the performance during the first 24 hours after the caffeine intake). Coffee can also reduce the risk of type 2 diabetes. Caffeine is able to suppress appetite for certain periods of time, which may become a helping factor when it comes to weight loss. Caffeine is known to boost energy levels and increase endurance in sports (however, the effect is always short-term). Because caffeine affects the adenosine receptors in the brain, it can relieve pain, including headaches and migraines. Caffeine is able to modify different brain dysfunctions, including depression. Coffee can protect the eye lens from the UV rays, which means fewer chances of cataract. Regular caffeine consumption is linked to the long-term improvement of thinking skills. Caffeine makes us happier by affecting the dopamine levels. It is obvious that coffee and other caffeinated beverages have a lot to love them for. And not only when it comes to flavor and taste. But here’s the deal: One can enjoy all these benefits only when taking caffeine in reasonable amounts. And that is not more than 4 cups a day (you’ll find more on healthy dosage below). Now, no matter how many positive effects coffee and caffeinated drinks have on our body and brain, some bad effects are possible too. The number of them is less than the number of positive ones, but they still must be mentioned. Coffee increases the amount of acid in the stomach, which can lead to acid reflux or heartburn. This is especially dangerous for people who already suffer from high acidity. It is recommended that they minimize the coffee intake. Because caffeine is diuretic (especially when consumed in large quantities), it can increase the urination or even cause diarrhea. While this isn’t really dangerous, it might lead to mild dehydration. But the issue can be easily fixed with a proper water intake (an extra glass or two would be enough). Coffee can play an important role when it comes to preparing for your studies (for instance, an important exam). Caffeine is able to improve your mood and mindset, make you more alert and attentive, and even improve your memory. Caffeine can increase one’s blood pressure. However, this is a temporary effect, which means it isn’t that serious. But it may still cause some discomfort, including increased heart rate. So, people who naturally have higher blood pressure than normal should control their caffeine intake more carefully. 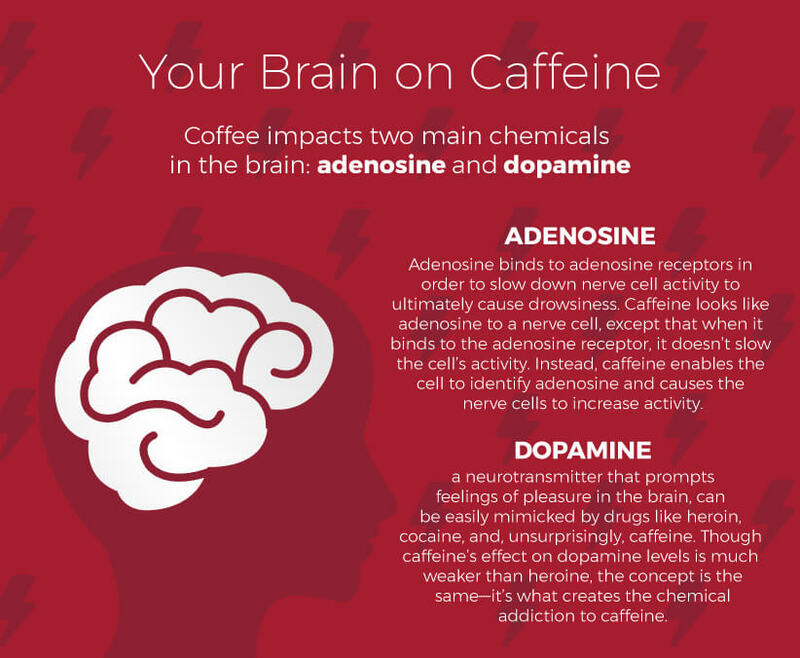 Because caffeine has an influence on our brain adenosine receptors, it can mess up our sleep cycles. Adenosine is a chemical in the central nervous system that sends the signals to the brain (and, consequently, the body) that it is time to rest. As a result, we feel drowsy. But because caffeine is a nervous system stimulant, it can block the adenosine receptors, thus causing us to remain awake and shifting our natural sleep cycles. Caffeine is often associated with slower calcium absorption and metabolism. However, one needs to drink huge amounts of coffee every day to feel any noticeable effect. Because coffee can increase one’s heart rate, it is dangerous for people suffering from any type of cardiovascular disease. Caffeine is a nervous system stimulant. Therefore, too much of it can cause restlessness, nervousness, or irritability. Especially in sensitive people. The effects of caffeine – both negative and positive – can reveal themselves differently in different people. After all, our bodies are unique. So, the fact that someone has experienced some of these side effects does not mean that everyone will experience them. Again, it is often a matter of the dosage. Caffeine consumption is proven to reduce the reaction time when it comes to visual and auditory choice tasks. This means students are able to make a choice quicker, deal with their tests more efficiently, and finish the assignments faster, thus increasing their productivity. Caffeine is able to battle the symptoms of sleep deprivation, including psychical signs like lethargy and cognitive issues like problems with attention. This is one of the main reasons students drink coffee and other caffeinated beverages. When being sleep-deprived because of their busy lives and immense academic workload, they choose to reduce the symptoms using caffeine, thus boosting their energy levels, improving their concentration, and, consequently, performing better in class. Caffeine consumption can influence the way we perceive new things. To be more exact, this stimulant increases the speed of encoding new stimuli in students, which means they are able to process the incoming information better. This, obviously, makes the learning process more effective and efficient, allowing students to respond faster to the new external stimuli. For instance, it can help them better deal with such tasks as categorical search, which means they will be able to find the needed information quickly and proceed with the rest of their tasks. While coffee can keep you awake, nothing can substitute for healthy sleep. Doctors recommend getting at least 7 hours every night. This might seem like a waste of your precious time, but look at it this way: when you get enough sleep, you feel better and your brain works better too. This means you can study better! It is also known that caffeine can positively affect one’s long-term memory. When it comes to academic performance, this can really come in handy. Caffeine consumption helps students memorize the new material better and keep it in their memory for longer periods of time, which can become a contributing factor to their academic success. Healthy amounts of caffeine can improve one’s cognitive function and alertness. Again, this means students can perceive the information better, analyze it more effectively, and show better results at school. Because caffeine increases the adrenaline levels in the body, it can keep students awake when they need it. This gives them more time to prepare for the next day and study more if needed. Additionally, this can help students improve their physical performance in sports. Higher adrenaline levels can help them remain energized longer and show improved endurance. Coffee and other caffeinated beverages and foods increase dopamine levels. This means they are able to make us happier, which would definitely have a positive effect on one’s academic performance. When students are in high spirits, they are more motivated to study and reach their academic goals, and this can drastically improve their performance. This one may seem far-fetched, but simply by socializing with other students over a cup of coffee, one can do something positive for his or her academic success (e.g. share ideas when drinking coffee, read each other’s notes, discuss a class matter, ask for your classmate’s insight on certain tasks, etc.). Seriously, one cup of coffee shared with fellow students might make a positive contribution to one’s academic performance. Coffee is known to improve one’s brain function, boost performance (and metabolism too! ), and even lower the risk of certain diseases. You can see now that there are many reasons for college students to love coffee and other caffeinated drinks. They taste great, help us socialize, and can even boost one’s academic performance. Such a great combo of properties in just one cup of a hot, flavorful beverage! It is known that a lack of sleep and coffee go hand in hand when it comes to college life. Because of an intense workload and limited time, students often get fewer hours of sleep and regularly pull the so-called all-nighters. And, of course, coffee helps them survive that. However, studies show that when one is sleep-deprived, caffeine has a weaker effect on them. This means that if a student doesn’t get enough sleep but hopes to get a mental boost by drinking coffee, things might not work out how expected. Caffeine can shift one’s sleep cycles and make them even more sleep-deprived. Therefore, it’s recommended to follow a healthy sleep regime and turn to caffeine only for an additional brain boost (preferably in the morning). If you have anxiety (or feel super nervous or even jittery), substitute coffee with another form of caffeine. It is better to avoid large quantities of coffee in this case because caffeine can increase your stress levels. So, instead of drinking another espresso to boost your performance or get energized, pour yourself a cup of green tea (and maybe a piece of chocolate, as cocoa contains caffeine too). Tea does have similar health benefits for you but offers a smaller amount of caffeine, which makes it a safer option. Stay hydrated. Caffeine is diuretic, which means it will make you lose some extra fluid. And if you drink cup after cup, you might even start experiencing some light dehydration symptoms, such as headaches. And you are well aware of how one little headache can mess with your performance. So, make sure you drink enough water overall and even more when you drink coffee. To boost your academic performance, don’t rely solely on coffee and staying awake longer. Try to switch your activities. For example, dedicate one day to researching, the next one to writing, and the next one to reviewing. Such a system ensures the information will sink in better. Don’t neglect healthy sleep. It might be tempting to pull an all-nighter and get some things done, especially when the due date is close. But remember that while you might get some extra time by giving up your sleep (coffee can help you here), the results might be disappointing. Your tired, sleep-deprived brain will find it hard to learn, concentrate, and retain information. Is it really worth it? Stay within the healthy limits. Too much coffee can cause anxiety, jitters, increased heart rate, high blood pressure, and headaches. All these side effects are unpleasant on their own but can also affect your academic life. So, try to drink healthy amounts of coffee. Doctors recommend sticking to the maximum of 400 mg of caffeine per day, which is equal to around 3-4 cups of regular coffee. However, keep in mind that different coffee beverages, foods, and energy drinks contain different amounts of caffeine. So, know your drink and try to control the intake. Listen to your body. Some people are more sensitive to caffeine than others and need less to get the “buzz”. So, pay attention to what your body tells you in order not to drink too much. Some medicine can interact with caffeine, so if you are taking any pills, be careful. Talking to your doctor to get a few pointers from his or her is highly recommended. Take a nap. This trick is based on science. You see, caffeine takes around 20-30 minutes to kick in. So, if you drink a cup of coffee and then lie down for 20 minutes, you will wake up super energized and ready to deal with all your academic tasks. Tea is known to be rich in caffeine. But not everyone knows that tea leaves actually have more caffeine than coffee beans. They just lose a lot of it when being brewed. A quick note: mate tea is also rich in caffeine. On average, one 8-ounce serving contains around 85 milligrams of caffeine. Cocoa is another natural source of caffeine, which means hot cocoa, chocolate, candy, and even chocolate ice-cream can give you a caffeine boost. However, it might not be that noticeable since the amount of caffeine in these products isn’t that large. For instance, an ounce of dark chocolate contains around 12 mg of caffeine. 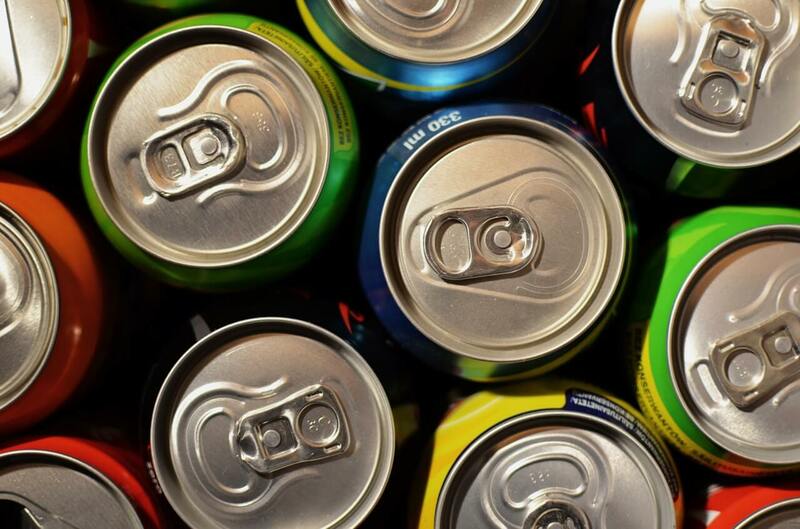 Energy drinks have a lot of hidden caffeine, but you must already know that. On average, an 8-ounce drink contains around 80 mg of caffeine, although some brands make beverages that have twice as much. That’s why you need to be really careful with energy drinks in order to avoid unpleasant symptoms. Soft beverages and soda may also contain hidden caffeine. The amount varies depending on each drink but it is usually between 22 and 69 mg per one ounce. Decaf coffee isn’t 100% caffeine-free. It may contain up to 12 mg of caffeine. Such an amount will not have a noticeable effect on you, but if you are trying to control caffeine intake, you should keep in mind that decaf coffee has some too. Medication, especially painkillers, often contain caffeine. That’s why it was mentioned above that consultation with your doctor is a good idea. But if you’re taking over-the-counter drugs, you should at least read the instructions first to see if they contain any caffeine. https://www.scientificamerican.com/article/how-does-caffeine-affect/ – More on the way caffeine influences one’s body (explained by biologist Neal J. Smatresk. https://www.nap.edu/read/18607/chapter/7#90 – Additional info on the caffeine’s influence on the central nervous system. https://www.mayoclinic.org/healthy-lifestyle/nutrition-and-healthy-eating/in-depth/caffeine/art-20045678 – More about the recommended daily dosage of caffeine. https://www.hsph.harvard.edu/nutritionsource/healthy-drinks/other-healthy-beverage-options/ – Tea as another caffeine-containing beverage: properties, benefits, and potential side effects. https://ucc.nd.edu/self-help/academics-study-abroad-careers/maximizing-academic-performance/ – How to maximize your abilities and academic performance. https://www.vistacollege.edu/blog/how-to-sleep-better-and-improve-academic-performance/ – More tips on improving one’s academic performance and its relation to healthy sleep. https://dailycoffeenews.com/2018/03/21/current-coffee-consumer-trends-inside-the-ncas-2018-report/ – Current coffee statistics across the nation. https://www.recservices.iastate.edu/blog/caffeine-affects-workout/ – More about caffeine and its effect on physical performance. https://www.medicalnewstoday.com/articles/322933.php – Caffeine overdose, risks, prevention, and guidelines. https://science.howstuffworks.com/innovation/edible-innovations/energy-drink.htm – Energy drinks as another caffeinated product. https://www.rd.com/health/wellness/drink-too-much-caffeine-solution/ – What to do when you’ve had too much coffee.